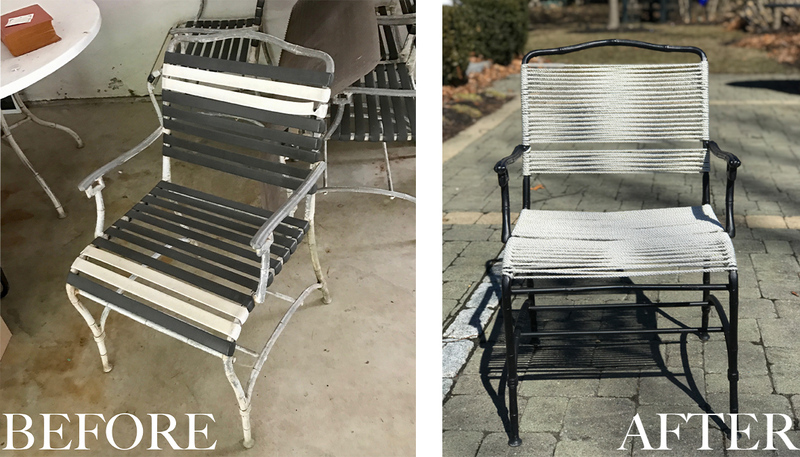 GORGEOUS SHINY THINGS: Walter Lamb-o that Patio Chair! This post was a slow birth. Like reallllly slow. 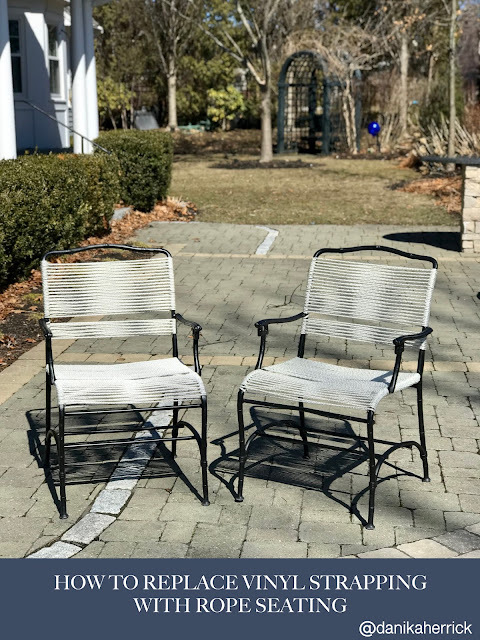 I actually found and redid these chairs about 2 years ago, started a "how to" post and forgot to finish it. Sorry. But since I did these 2 years ago I can safely say this worked AND held up. 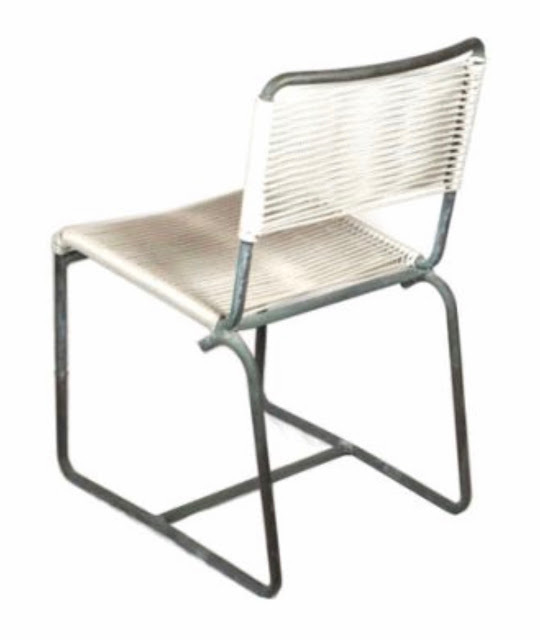 When I found these chairs they had great aluminum bamboo frames with not so awesome vinyl straps. Now, I'm not saying I don't like vinyl strapping. I do. It can give you a retro, Slim Aarons vibe real quick if done right. bring me my caftan & drink. But mine needed love and were crappy brown. I wanted a different replacement material other than vinyl. After lots of searching I stumbled on some vintage Walter Lamb rope chairs. 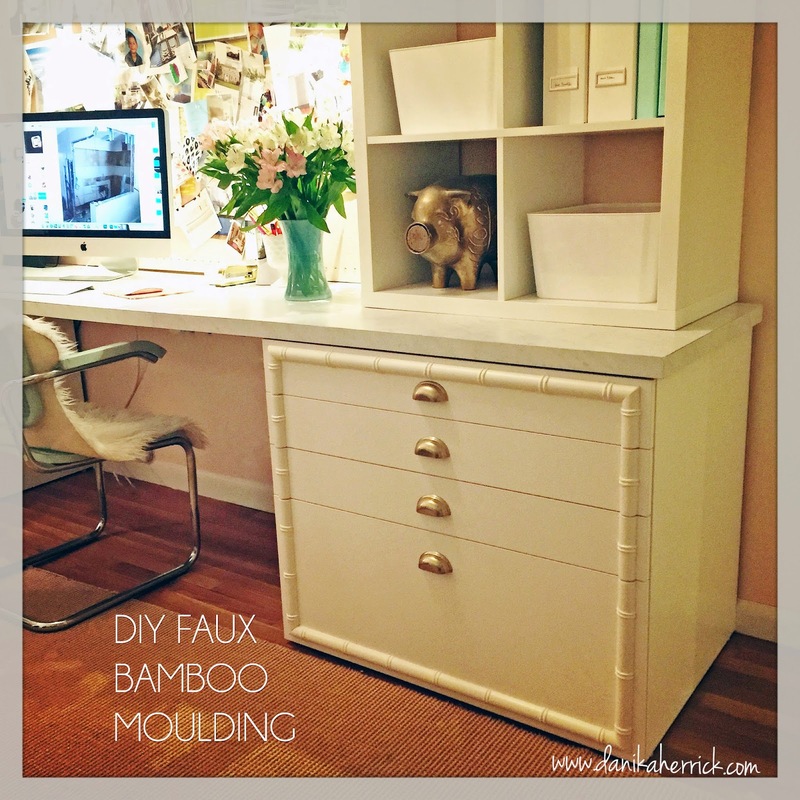 The rope gives it a modern nautical feel, and my bamboo frames had a classic, chinoiserie look. I was ready to marry the two together! So let's skip to the DIY, OK? 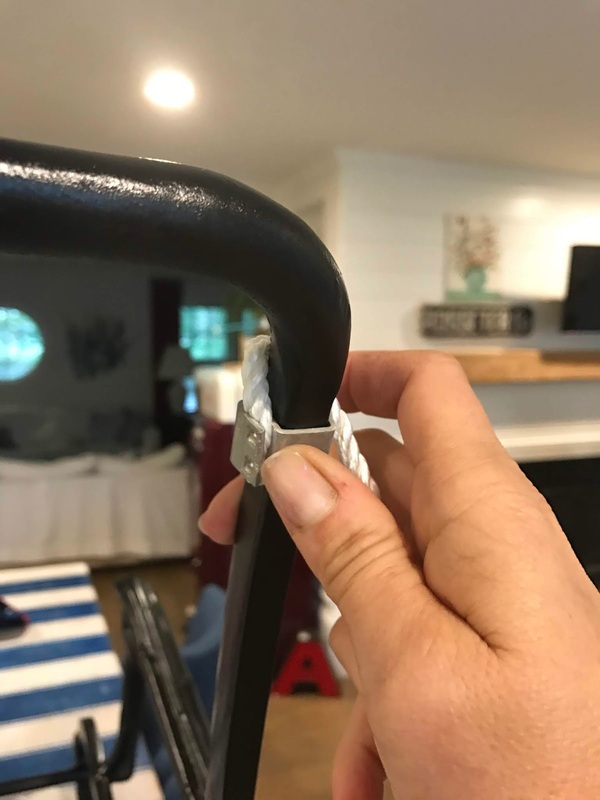 -A chair While this tutorial is meant for vinyl strap replacement, you don't have to have them. -Polyester Rope I went with 1000 ft spool of this one. It had a soft smooth texture, was mildew resistant and had low stretch. Avoid cotton- it can sag if it gets wet, hold moisture (wet bums) and grow mildew. Also street clear of scratchy nylon versions (pain in the bum). -Fasteners If you are removing vinyl strapping you will probably have a metal S, E, or J clip. You might be able to reuse yours or just buy new ones here. 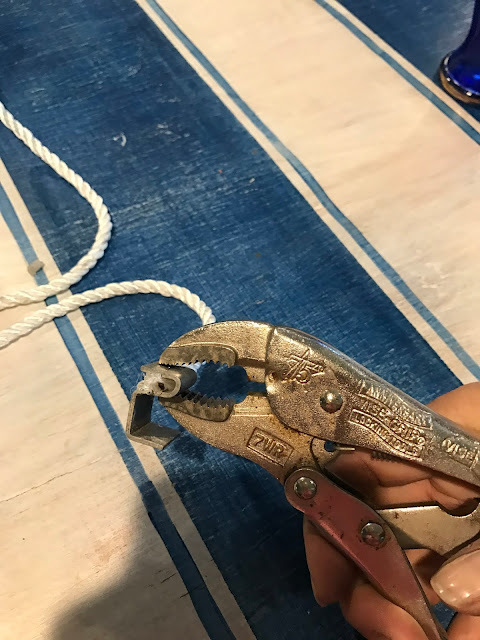 If you don't have clips I recommend visiting the hardware store and getting some aluminum sleeve crimps or a rope clamp sized to the diameter of your rope so you can have a secure attachment for the rope. You can always get creative with knots, but I'm no Boy Scout and I don't want you falling through. And if you are using wood frames you can secure with nails or staples. -Heavy Duty Piece of Cardboard or Wood Or something to wrap the rope around to make a shuttle. The rope can tangle very fast, so I cut my lengths and then wrapped them on a shuttle to make the weaving part hassle-free. Now let's change that seat! 1) Remove all the old vinyl strapping. 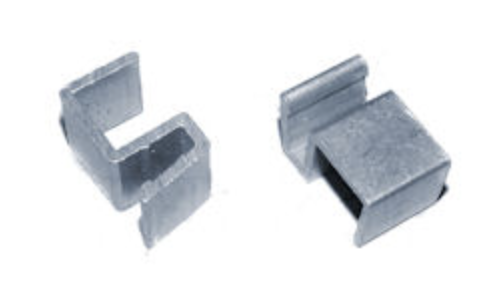 The fastest way to do this is to cut right down the middle of each strap and the brackets or rivets holding them in place should pop off on each side. Check your clips to see if they are reusable. Clean, sand and paint the chair frame if needed. I decided to go black. 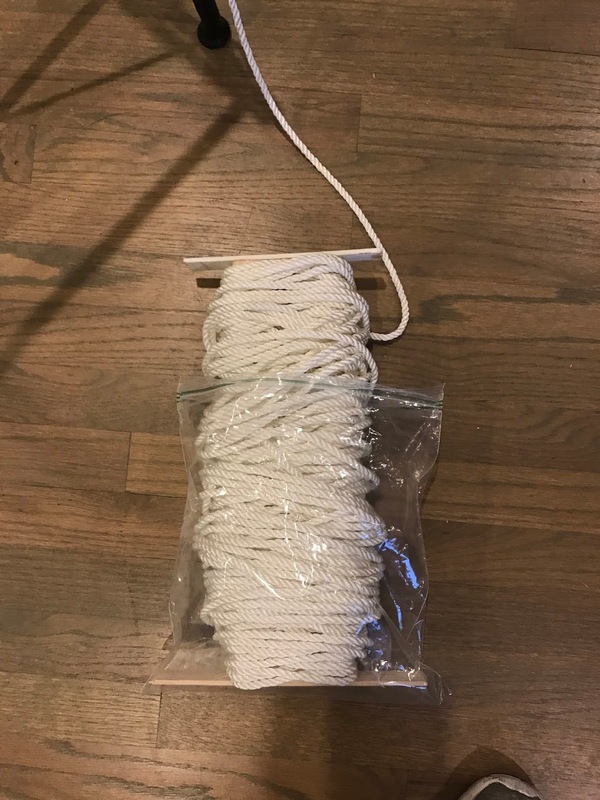 My rope came on a 1000 ft. spool which is a lot of rope to manage and weave back and forth. I cut it into manageable lengths for the seats and the backs. So for example, (A) the area I wanted to cover on my seat was 18" deep. Next I took a piece of rope and wrapped it twice around the left side of the frame, brought it over to the right, wrapped it twice on that side, and then back over to the left. I measured that length and it was 48"(D) and I multiplied it by (C) 9. I would need 432" of rope for my seat. I added a few extra feet just in case. 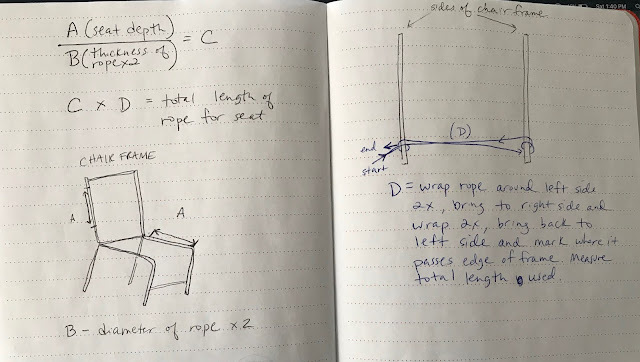 I did the same equation for my seat backs. They only needed to be 12" high, so they needed less. Once I had my length cut, I wrapped it around the shuttle and slip that into a plastic back to keep it from catching or tangling. Attach your rope to your faster. I used vice grips to pinch the clasp onto my rope. I placed my clip onto the frame of my chair and began wrapping the rope. You might need an extra set of hands to get started. The rope will cover the clasps. The weave will be very similar to how you wrapped the rope when you first measured. Wrap over the sides twice, bring it across to the opposite side and under and over twice again. Bring it back over to the opposite side and repeat. 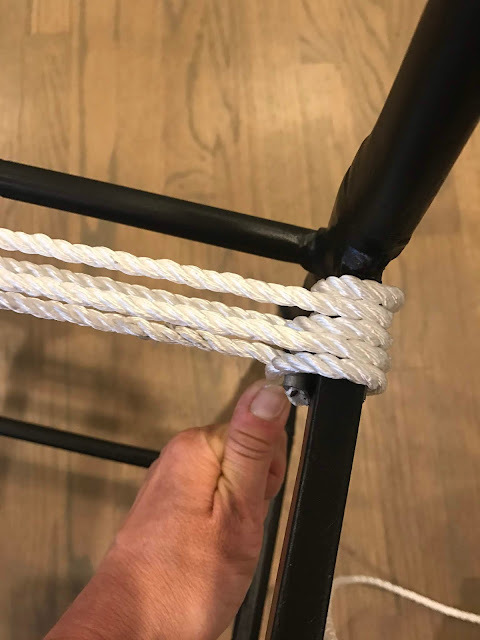 Be sure to pull tight and have a bit of tension on the rope so it doesn't sag. 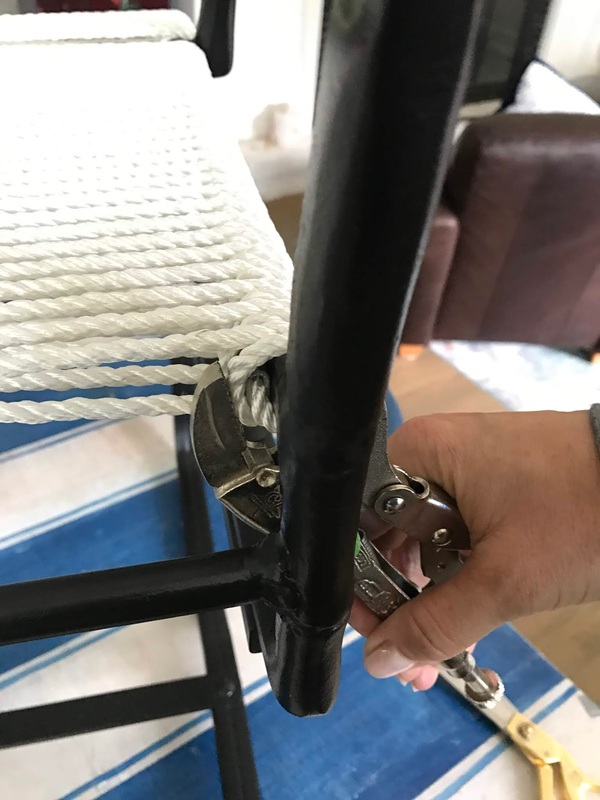 I used the vice grips to hold the rope in place when I needed a break. 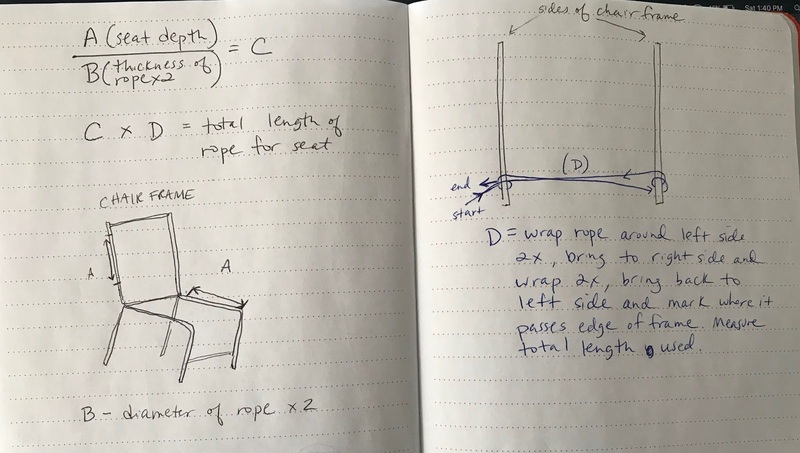 The pattern you are trying to achieve is a figure 8 that occurs in the center of the seat, and by wrapping the sides twice before going back across you get a nice spacing between the ropes. 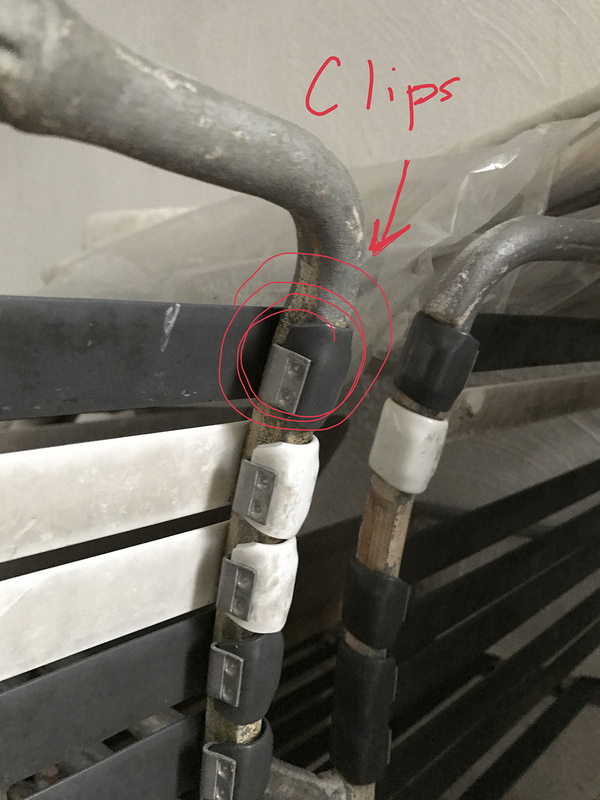 When you get to the end you will add another clip to secure it. 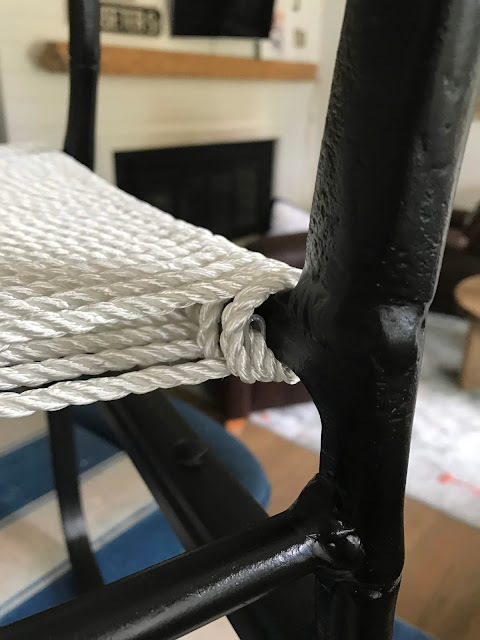 I had someone hold the clasp in place on tree chair frame when I was about an inch away from finishing and then I wrapped my rope over it and tucked the end into the clasp. I then squeezed the clasp shut onto the rope with vice grips and cut the rope. It took a little practice, but by my third chair you could barely see the clips! 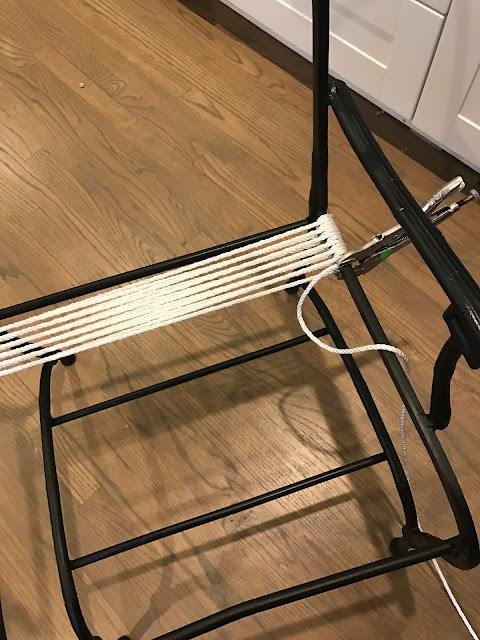 This is the chair after 2 years of use, still going strong!